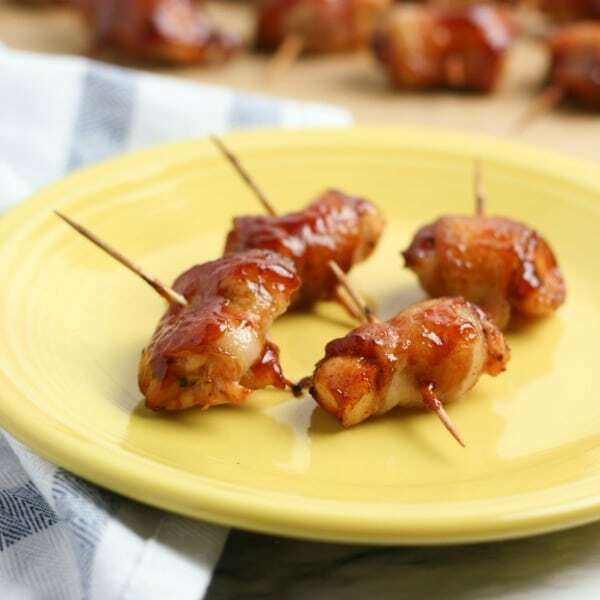 BBQ Bacon Wrapped Chicken Bites are the perfect appetizer for the big game or any party. The combination of barbeque sauce, bacon, and chicken is out of this world. This is a finger food that won’t stay on the platter. I love to entertain and am a firm believer that you don’t have to wear yourself out before the party to throw a great event. Simple, but delicious appetizers are my favorite party foods and these BBQ Bacon Wrapped Chicken Bites are a perfect example. I love bringing a platter of appetizers to a party and knowing I won’t be taking any leftovers home. 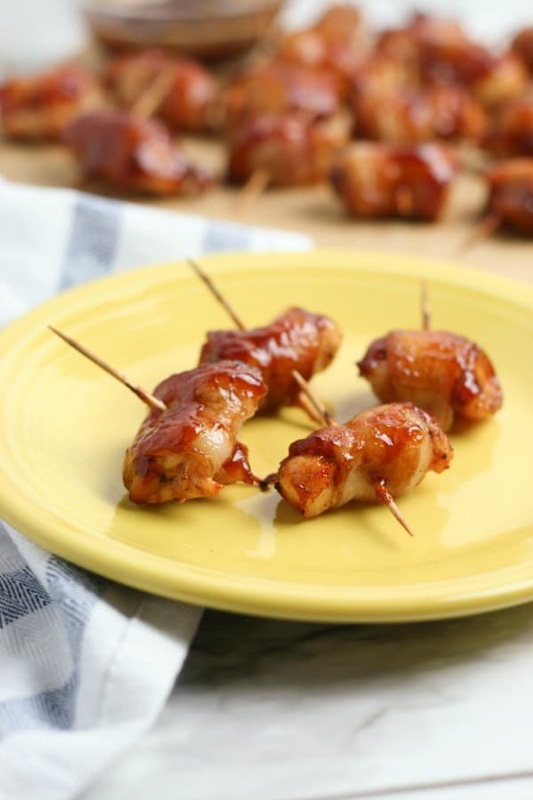 This recipe for BBQ Bacon Wrapped Chicken Bites is exactly that kind of appetizer. People seem to love finger foods that have a toothpick in them. I admit that a toothpick makes these delicious bites very easy to eat and you have messy fingers. The other nice thing about these BBQ Bacon Wrapped Chicken Bites is they are great YEAR ROUND. I like having an appetizer recipe on hand that I can make anytime for any event. I like how this recipe uses basic ingredients you can find at the store. There is also a good chance I will have all the ingredients on hand. Whenever I can skip an extra trip to the store I take advantage of it. 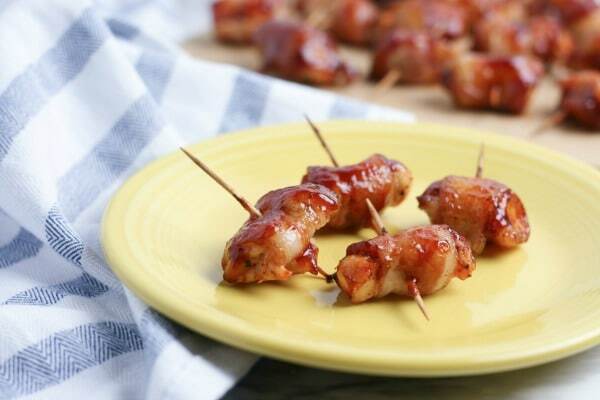 BBQ Bacon Wrapped Chicken Bites are easy to make and my kids can even help me in the kitchen with the preparation. Go ahead and preheat the oven to 400° F. Now take a baking sheet and line it with aluminum foil. Place a wire cooling rack on top. This wire rack is very important and allows these to crisp up. You don’t want them to be sitting in grease. There are actually quite a few ways to use a cooling rack besides cooling cookies! If you haven’t already cut your chicken into small bite-sized piece now is the time to do that. Be sure to cut each slice of bacon into 4 equal pieces. Season each chicken bite with the barbeque seasoning. I just put the chicken in a bowl and sprinkle the seasoning on the chicken and stir to coat each piece. 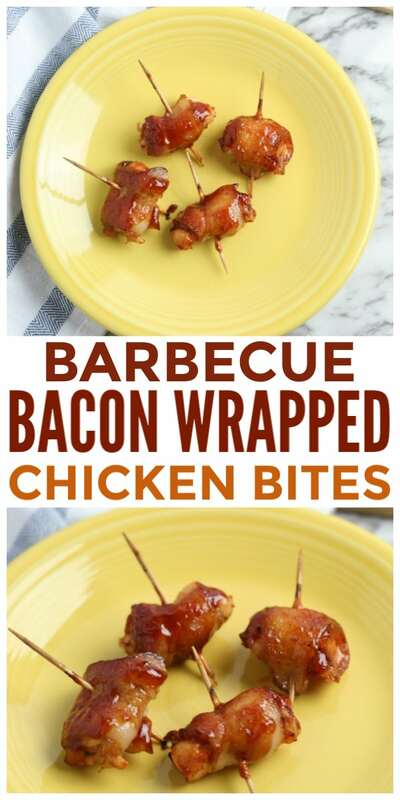 Wrap each bite of chicken with a piece of bacon and use a toothpick to secure them together. Place all of the wrapped chicken bites onto the cooling racks and bake in the oven for 20 minutes. When the timer goes off remove the BBQ Bacon Wrapped Chicken Bites from the oven and brush barbeque sauce on top of every single piece of chicken. Put the bites back into the oven and broil for 5 more minutes. The hardest part for me is to make sure my BBQ Bacon Wrapped Chicken Bites actually last long enough to put on a platter and take to the party. There are a lot of kids running around my house who like to stop in for a quick test bite. Before I know it the platter is a lot lighter! Be sure to PIN this recipe so you can make it again and again! 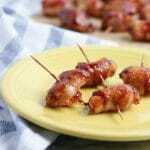 BBQ Bacon Wrapped Chicken Bites are a delicious appetizer and work perfect for any gathering. Preheat oven to 400 degrees and prepare a baking sheet by lining it with aluminum foil and placing a wire cooling rack on top. Season chicken with barbeque seasoning. Wrap each piece of chicken with a piece of bacon and secure with a toothpick. Bake the chicken pieces on top of the cooling rack for 20 minutes. Remove from oven and brush barbeque sauce on each piece of chicken. Return to oven and bake under the broiler for 5 more minutes. These chicken bites look fantastic, and just in time for the Super Bowl! Found you at Friday Feature. 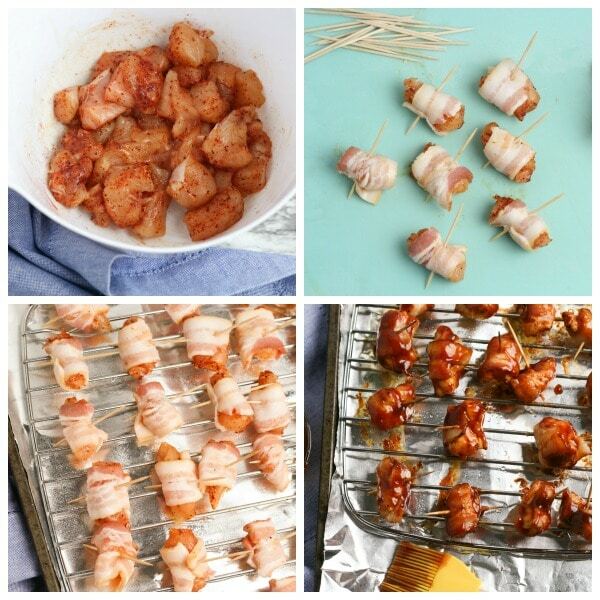 These will make great Game Day appetizers! They look delicious, I’ll be adding them to my Game Day Roundup. Thanks for sharing Sunday’s Best.